In 1928, at the age of nineteen, college student August Derleth wrote to Sir Arthur Conan Doyle asking him whether he planned to produce more Sherlock Holmes stories, and if not, then he, Derleth, would begin a series of pastiches of his own. Sir Arthur promised nothing, so Derleth went ahead, creating Solar Pons. Between Pons' first appearance in 1929 until Derleth's death in 1971, the bite of the Sherlockian bug prompted him to write more than seventy Solar Pons adventures in the best Holmes tradition. 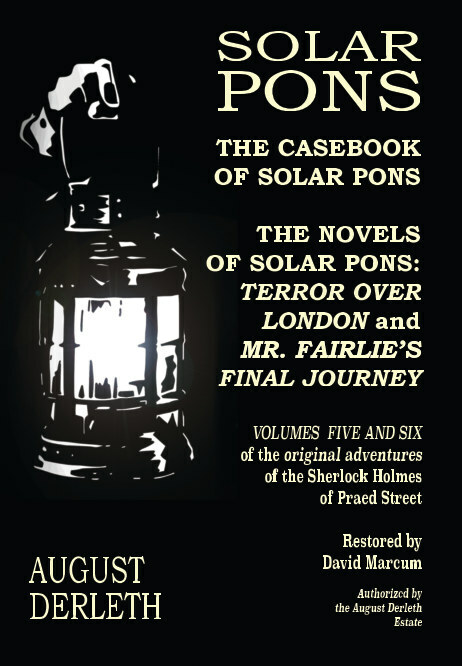 Now, restored from the original 1965 Mycroft and Moran edition, Solar Pons is back in this fifth collection, The Casebook of Solar Pons, containing twelve incredible adventures, including the eerie matter of "The Whispering Knights", the surprising affair of "The Haunted Library", and the mysterious adventure of "The Sussex Archers". This newly restored edition also includes the sixth Pons collection The Novels of Solar Pons, featuring the only two Pons novels that Derleth ever penned - the Golden Age style Mr. Fairlie's Final Journey (1968) and the Sax Rohmer-influenced Terror Over London, written when Derleth was a young man in his twenties, and then filed in his papers and lost, only to be discovered decades after his death. Each of these tales are guaranteed to delight both Pensions and Sherlockians!